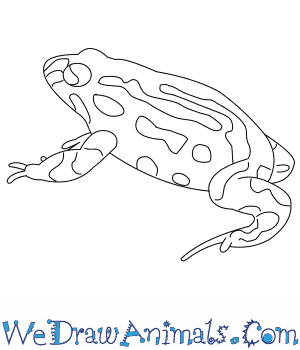 In this quick tutorial you'll learn how to draw a Corroboree Frog in 6 easy steps - great for kids and novice artists. 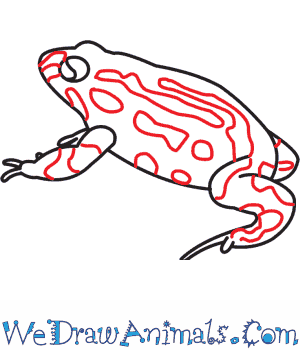 At the bottom you can read some interesting facts about the Corroboree Frog. 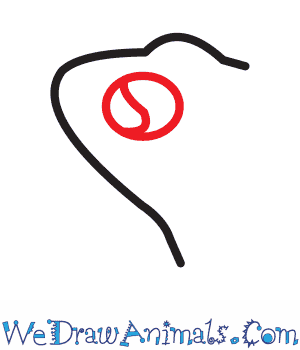 Step 1: First, draw the rounded head of your frog with a small lump at the top for where the frog's far eye is located. 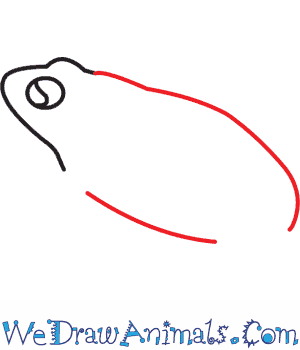 Step 2: Draw a circle that takes up most of the space on your frog's head. 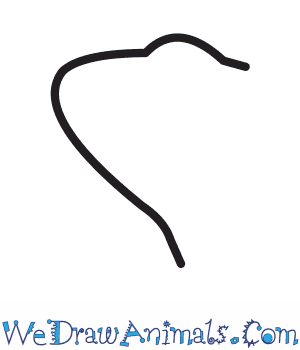 Draw a curved line for detail in the eye. 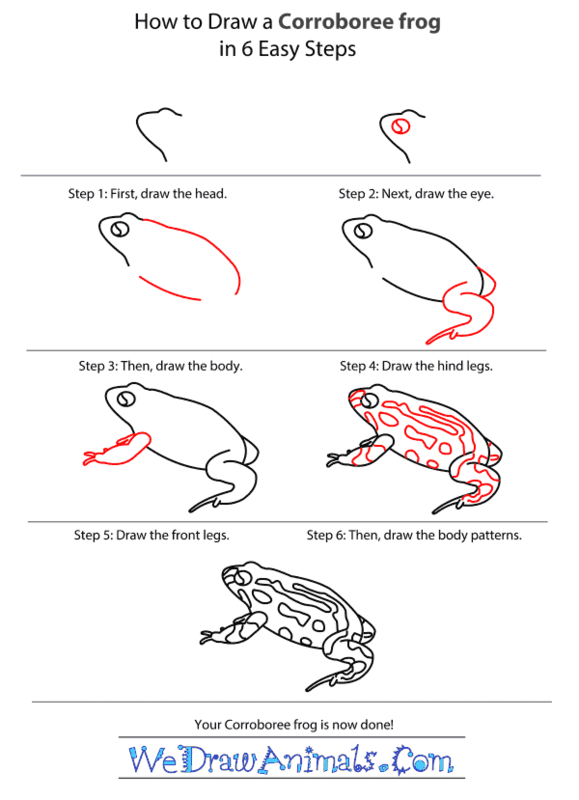 Step 3: Next, draw the body of your frog. The back line should be longer than the curved chest line beneath it. 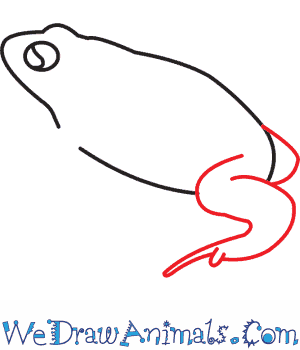 Leave two open spaces at the front and back of your frog for where its legs will be drawn. 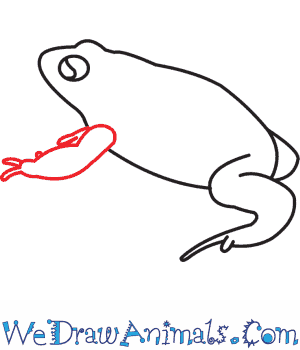 Step 4: Draw the hind legs by making one small arch that connects to the frog's back in the middle. The hind leg closest to you should curve from that empty spot you left in the back and the foot should have two long rounded toes. Step 5: Draw the front legs shorter than the back. Don't use straight lines for the front legs. Instead, the legs should be slightly curved to look like the frog has a bulging muscle. Step 6: The last step is to bring your frog to life by adding its unique pattern using many different shapes of varying sizes all along the frog's body. The Southern Corroboree frog (Pseudophryne corroboree) is native to Australia. It has one counterpart, the Northern Corroboree frog, which looks slightly different and lives north of the southern species. The Corroboree frog takes four years to mature, spending two years as a tadpole and two years as a juvenile. Male Corroboree frogs make burrows and will attract up to ten females into these burrows to mate with them. The females will lay their eggs in the burrow, and the eggs will develop normally until they are ready to hatch. At that time the eggs will stay unchanged until rainfall fills the burrows, and that is when they will hatch and the tadpoles will emerge. Corroboree frogs eat mainly insect larvae, ants, and beetles. Tadpoles will also eat algae and other small organisms in the water. These frogs produce poison from their skin as a defense again predators and microbes. If eaten, this poison can be lethal to mammals. Lesson plan note: Discuss how the Corroboree tadpoles would be affected if they hatched before rainfall, and how that would influence the way they have evolved to hatch only during rainy season.